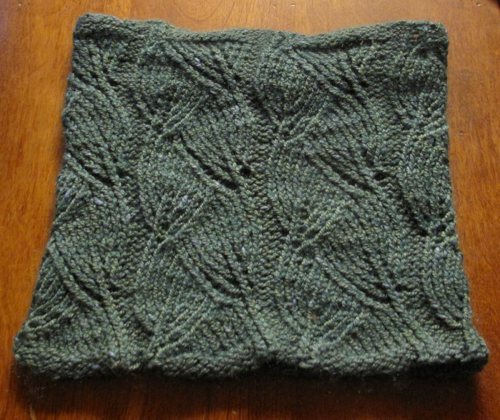 When I was at NIPS in December, I knitted this cowl start to finish--conferences involve a lot of sitting a listening, which is prime knitting time. (For those of you who don't know what a cowl is, it's tube-like neck warmer.) I found it harder to pay attention after I was done with it since I'm not very good at sitting and listening for hours on end, no matter how interesting the topic. When I started this project, I realized that I knit in a funny way. The way I learned to knit was as follows: I learned just the knit stitch as a teenager (but not the purl) and made a scarf with just the one stitch. Then, I decided to relearn for a shawl two summers ago. That involved purling, and when I was taught how at the yarn store, I didn't like it. So I spent fifteen minutes at home trying to figure out a smoother way to purl, and went with that. Since then, I've realized that what I worked out is called combination knitting. There are a few oddities, but it's much faster and smoother for the stitches you use most frequently. For this (my third!) knitting project, I had to learn how to decrease stitches where orientation of the slant matters, which is the main peculiarity of the combination method. That mastered, I feel like I can take anything! Anyway, I love wearing my cowl and I've gotten a few compliments for it. It's by no means perfect, but I think I'm ready to start knitting gifts for folks now.